Description: When nineteen-year-old huntress Feyre kills a wolf in the woods, a beast-like creature arrives to demand retribution for it. 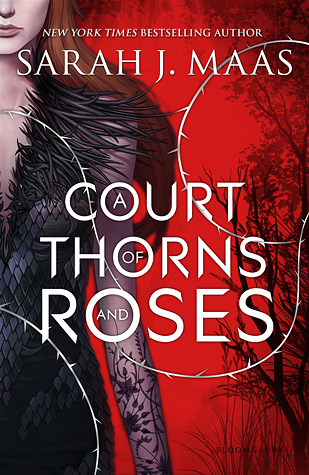 Dragged to a treacherous magical land she only knows about from legends, Feyre discovers that her captor is not an animal, but Tamlin - one of the lethal, immortal faeries who once ruled their world. As she dwells on his estate, her feelings for Tamlin transform from icy hostility into a fiery passion that burns through every lie and warning she's been told about the beautiful, dangerous world of the Fae. But an ancient, wicked shadow over the faerie lands is growing, and Feyre must find a way to stop it . . . or doom Tamlin - and his world-forever. My Thoughts: Feyre finds herself swept north of the Wall and into the land of the immortal faeries when she kills a wolf in the woods. She is taken to the home of Tamlin who is the Lord of Spring. The lands of the Fae are under the control of a tyrant and it is up to Feyre to try to free them all. But Feyre is a weak, illiterate human and the tyrant is strong enough to cow the much more powerful Fae lords. This fantasy has some similarities to Beauty and the Beast in that Feyre is the youngest daughter of a man who has lost all his wealth and retreated to a small village. She has two older sisters who are either hateful or helpless. Feyre made a promise to her mother before she died that she would take care of her family. So, at age 11, she began trying to do so. It was hunting in the woods in order to keep them all from starving that led to her encounter with a wolf. However, in many ways, it is quite different than the fairy tale too. Feyre is not her father's beloved and favorite daughter. He has not taken his impoverishment and the beating that followed it well. He seems to be in a state of depression. When Feyre finds herself at Tamlin's estate, she learns that many of the ideas that she had about the Fae were not correct. She finds kindness from Tamlin and from his servants. She also finds that there are still many dangers to humans in the Fae territory. There are many of the Fae who are incredibly dangerous. As she gets to know Tamlin better, she begins to fall in love with him. After declaring his love, Tamlin sends her back home to keep her safe. She doesn't want to leave him. When she realizes that she no longer fits at home, she tries to go back to Tamlin and then learns a secret that he had been keeping from her. He was under a curse that bound him to Amaranth is he couldn't convince a human to declare her love for him. Feyre is determined to free him from the curse and goes through all sorts of trials to try to free him. This was an amazing story that was well-written, filled with fascinating characters, and very fast-paced. I can't wait to share it with my students and I can't wait to read the rest of this series. "I made a promise," I said, my breathing ragged. "To my mother, when she died. That I'd look after my family. That I'd take care of them. All I've done, every single day, every hour, has been for that vow. And just because I was hunting to save my family, to put food in their bellies, I'm now forced to break it."